Joining us at Hagley Oval on Saturday? Here’s everything you need to know! Dec 23, 2018 – Otago Volts chased down Canterbury’s 184-5 with three balls to spare thanks to good knocks at either end of the innings from Hamish Rutherford and Anaru Kitchen. Dec 14, 2017 – Canterbury’s Kings hit the ground running in the Burger King Super Smash with a whopping 134 run record win over the Volts — despite another Jacob Duffy T20 five-fa. Canterbury Kings: Cole McConchie (c), Jeremy Benton, Chad Bowes, Leo Carter, Andrew Ellis, Cam Fletcher (wk), Kyle Jamieson, Tom MacRury, Steve Murdoch, Ed Nuttall, Henry Shipley, Will Williams. Māia Health – Māia’s current focus is on enhancing the rooftop helipad to provide quicker, faster access for emergency care. The plans for the redevelopment of Christchurch Hospital had provision for a smaller helipad; Māia is raising funds to provide for a purpose-built and future-proof rooftop helipad. Look out for a big polystyrene 13 at the gate – Bring a gold coin and show your support. We will have our giant inflatables to the left of the entry gate. Bring the kids along and test out their own cricketing skills. SISTER KONG BAR – Cassels and Sons beer, Beefeater GIN, Giesen Wine. Pick up some Kings Merchandise at the Purple Dynasty Sport tent at the top of the Embankment. 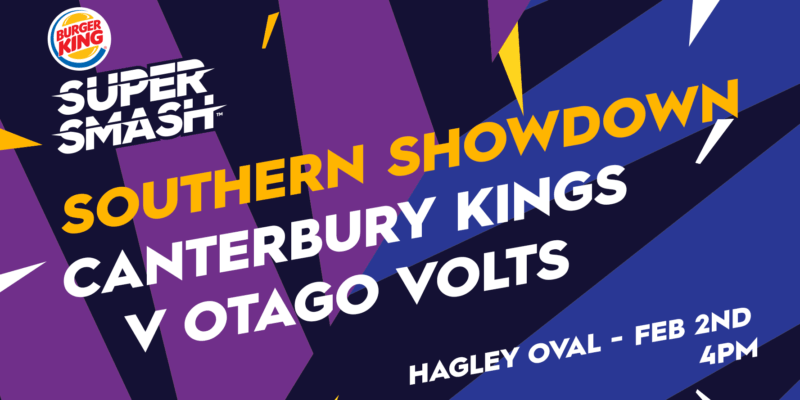 Catch all of the Canterbury Kings and Otago Volts players after the game to the left of the pavilion.